Responding to a museum show that brings Street Art inside and charges admission to see it, a local Street Artist tweaks the nose of MOCA’s “Art in the Streets” with some actual Street Art in situ. Ironically, it also drew a crowd of curious admirers to the sidewalk. A testament to the current fascination among teens, 20 and 30-somethings with the entire topic of Street Art, observers report that the installation of Colla’s piece drew a small crowd of tourists, who took turns snapping photos and posing in front of it – some of which we show here. Even more incredibly, after the poster company covered it and left yesterday, witnesses say a bystander apparently began removing the advertising posters. Reached for comment, the artist told us the message of the piece is pretty self evident and he hung around after putting it up to listen to people stopping to take pictures. Brooklyn Street Art: What kind of reaction did the installation get on the street? 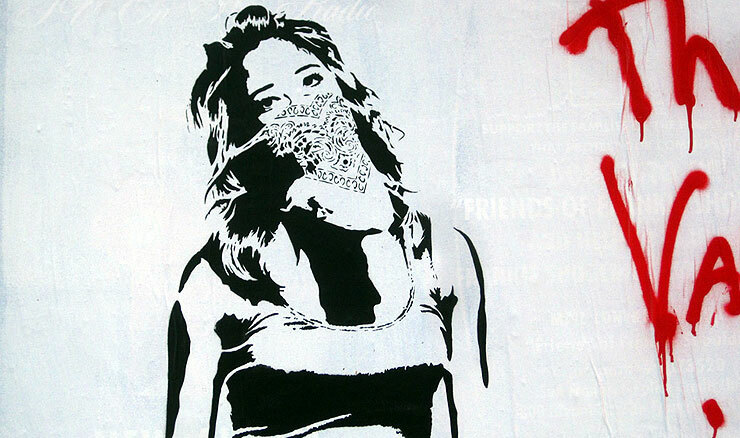 Eddie Colla: It ranged from “Is that Bansky?”, “Are you Banksy?”, “I think that’s f*ckin Banksy”, and “Holy sh*t! 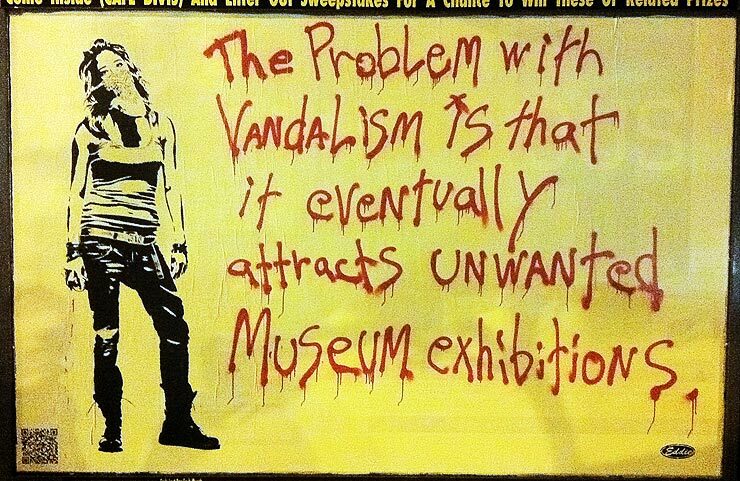 It’s Banksy”. 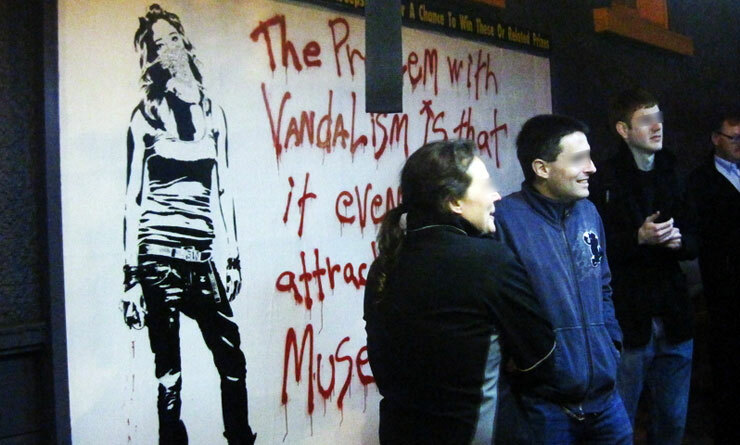 Of course there’s the one nob who always mispronounces Banksy and says “Yo It’s BAN-SKY”. 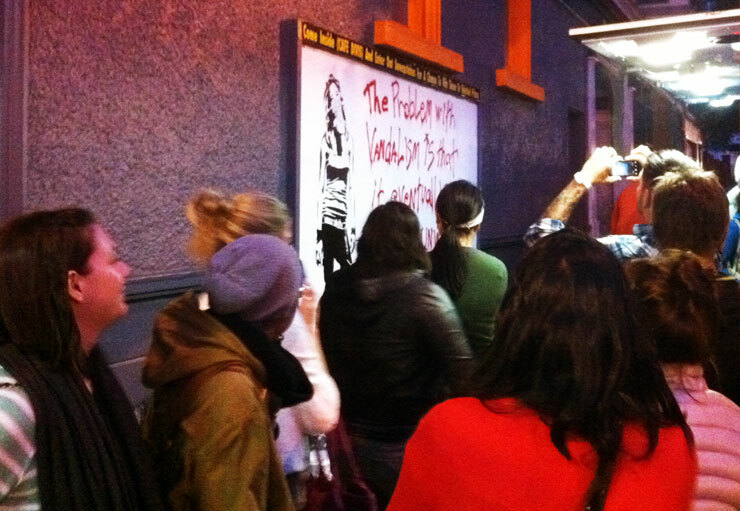 So there was that and a couple “hey cools” and “what do you make your stencils out of?” and “you’re eddie right?”. Brooklyn Street Art: Did you think that people would actually pose in front of it for a group photo? Eddie Colla: Sure why not, It’s a nice sort of background. Much better than the movie posters that were there when I started. Brooklyn Street Art: When do you think this Street Art madness, I mean fascination, end? Eddie Colla: When they release “Exit through the gift shop 2 – Electric Boogaloo”. I think that will be the beginning of the end.